Child3-12 yrs old. Under 3 ride free. See and hear about the majestic Statue of Liberty, Ellis Island, the historic Immigration Center, and the World Financial Center. Stare up at the awesome skyscrapers that make the fabulous skyline come alive. This tour turns 60-minutes into a quick and inspirational way to see New Yorks highlights from the water. Narrated tour that is humorous, yet informative. Discover New York with the City's best tour guides. Food and Drink are available on board. Since 1945, Circle Line Sightseeing Cruises has entertained over 60 million passengers, young and old, with the world's most famous boat rides. Providing generations of visitors with magnificent views of the Manhattan skyline and interesting tidbits about the city and its surroundings, Circle Line Sightseeing Cruises is a true New York institution and a "must-see" attraction while in town. The Liberty Cruise offers a great way to spend a morning, afternoon or weekend. During the cruise, passengers will enjoy a humorous, yet informative, tour given by talented, energetic, knowledgeable and certainly entertaining tour guides. Whether you are exploring New York for the first time, rediscovering your hometown or seeking a mini-vacation, the Liberty Cruise is a relaxing and fun way to see the world's most famous skyline. Beverages, wine, beer, cocktails and food are available on board. 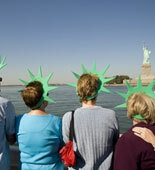 Get your eTickets today and discover a different view of New York on the Liberty Cruise! Oct 29- Mar 9: Daily at 10:00 am. 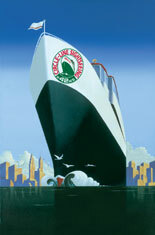 Special 1:30 sailings on: Nov 3, 9, 28, 29 & Dec 9. Mar 10- Mar 31: Daily at 10:30 am, 2:30 pm. Apr 28 - Sept 3: Daily at 10:30 am; 2:30 pm & 4:30 pm. Sept 4- Oct 28: Daily at 10:30 am, 2:30 pm. Closed Christmas Day. Reservation tours ONLY on New Year's Eve and 4th of July. Vouchers not allowed on New Year's Eve and 4th of July. 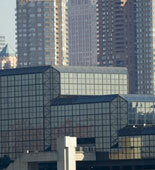 Pier 83, West 42nd St and 12th Ave, New York, NY 10036. Please arrive with printed eTicket and bring it to the ticket window at least 1/2 hour in advance of sailing time to exchange for a boarding pass. West 42nd Street and 12th Ave. Parking is available on Pier 83. Mon through Fri $25 before 3pm, $30 thereafter. $30 all day on Sat and Sun. Child Ticket: 3-12 yrs old. Under 3 ride free. Reservations are not required. It is advised to call 24 hours in advance of desired tour date to check on tour times. Don't forget to bring your camera to capture your new memories!